The Zoom H2n is a portable sound recorder looking like an old fashioned microphone it is a handheld device that provides an assortment of stereo and surround recording modes, it records onto an SD card in MP3 or WAV format with options for various bitrates and frequencies. The unit is powered internally by two AA batteries and can also be powered from the USB port. The recorder I am experimenting on has firmware version 2.00 installed. 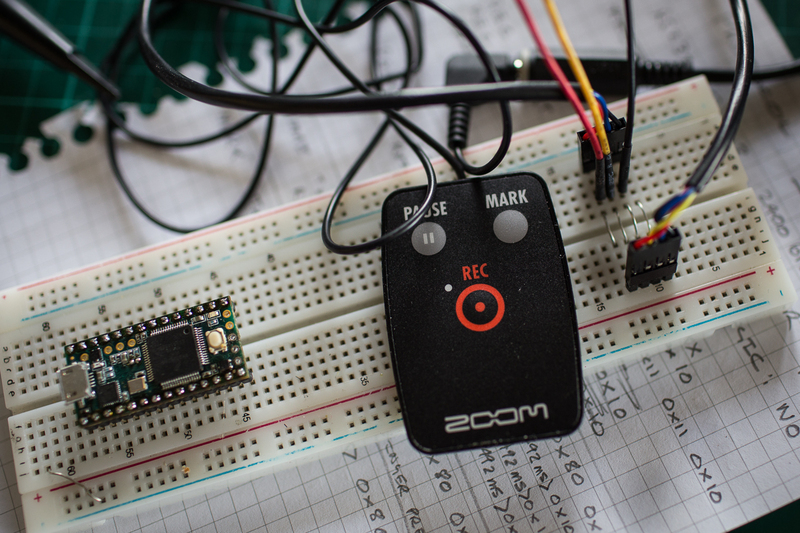 The Zoom Remote Controller RC2 is a wired four pin 2.5mm jack plug connection, this remote has three buttons: record, mark, and pause there is also an LED to show when the H2n is recording. It is purchased separately from the recorder and only appears to be available bundled in an accessory pack. It looks difficult to take apart without leaving some damage, and this may not be necessary for decoding. In this post I am looking to see how the remote works and find what control method it employs so in Part Two I can use an Arduino style micro-controller to provide an external trigger such as for timed recordings. When checking with a multimeter I found continuity from the negative of the left battery (on the Mic Gain side) to pin three, ground, of the jack, there is also a connection between the positive of the right-hand battery to pin one of the jack but on the multimeter in diode mode there looks to be a capacitor, the voltage rises until no apparent connection is indicated. With no activity on the recorder the RX and TX pins show ~2.7 volts. Determining the RX and TX pins turned out to be straightforward. 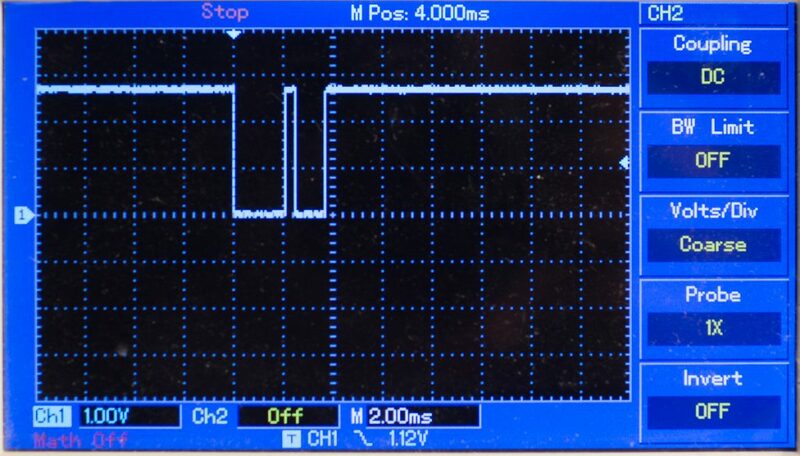 When you press the record button after a moment the recording LED lights up, on the oscilloscope I can see three different square wave patterns for the three different buttons on the TX pin and a single type of square wave on RX to light the LED. 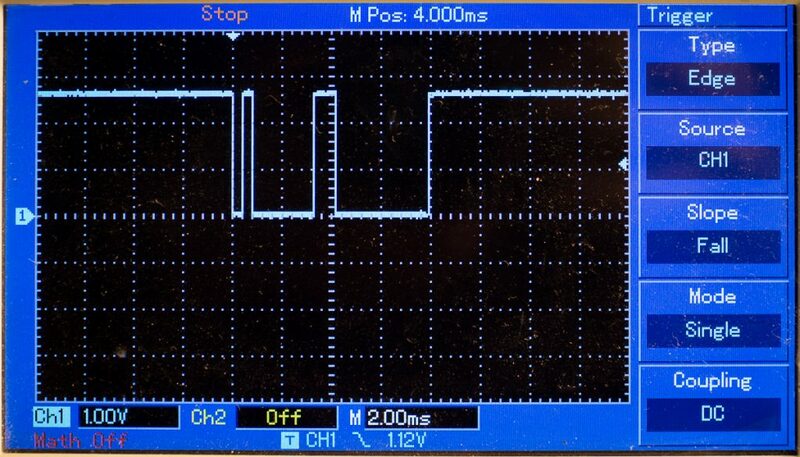 The following images show the signal for the record button then that sent in response to to light the LED. Also when buttons are pressed on the recorder data is seen on the RX line. For a more detailed examination I will need to break out the logic analyser. I was also able to capture the following activity sent to the remote when various buttons were pressed on the recorder itself with the recorder in XY Stereo mode. 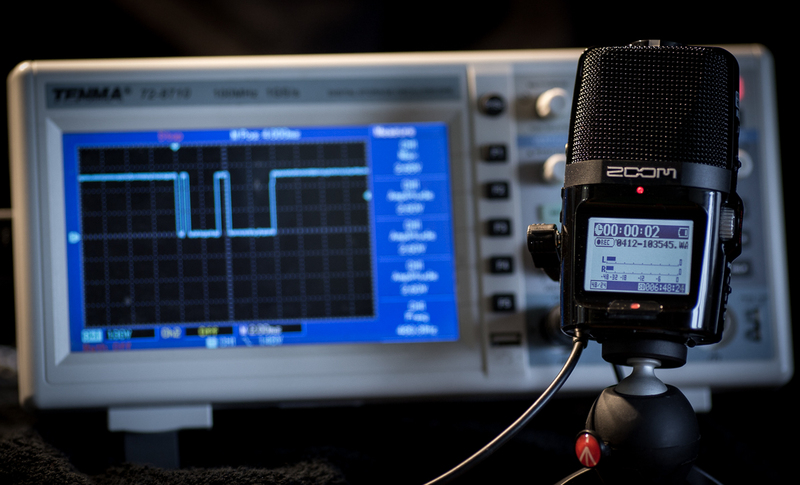 Other models of the recorders made by Zoom have more advanced remotes, such as the RC4 as featured in this hack of the H4n. I suspect they would work on this machine too. 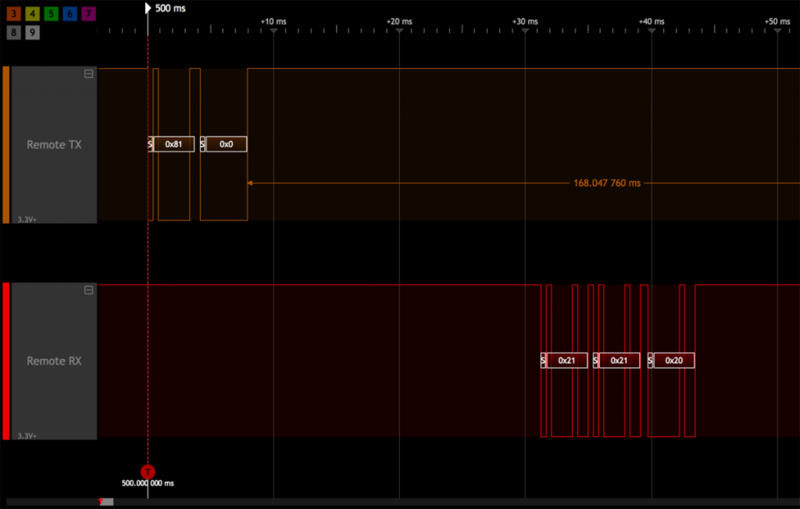 This time I set the logic analyser to trigger with a falling edge on Remote RX. I think the 0x20 code is used to indicate the display illumination has been turned off. I saw activity on all buttons except the Mic Gain knob. I think these response codes are to light up various LED’s on the more advanced Zoom RC4 remote, this suggests that other remotes would work in this recorder. In Part Two I will be covering the use of a Arduino style micro-controller as an alternative remote control.